Lately, I’ve been hearing these words in my sleep. So thanks, guys! Now because we love you all, it just so happens that your persistence has paid off! We talked at length about how ‘The Stampede Is Coming’ trailer was captured in-game, but we know it’s hard to truly visualise that. So we thought we’d show you instead! What you can see in the video above is recorded from one of the camera angles you will experience when you boot up ONRUSH in June. Hopefully this quick blast along Sanctuary Shore scratches your chase cam itch for now – but if not, don’t worry. In the coming weeks we will have plenty of gameplay footage to share with you and talk about in more depth. I’m sure you now have even more questions after watching the video, so I’m going to pre-emptively answer one – ‘what are fodder?’ Well, I’m glad you asked! Fodder are neutral AI vehicles that are always in the action. Their sole purpose is to create some carnage and offer YOU, the player, a chance to take them down for an instant hit of boost. 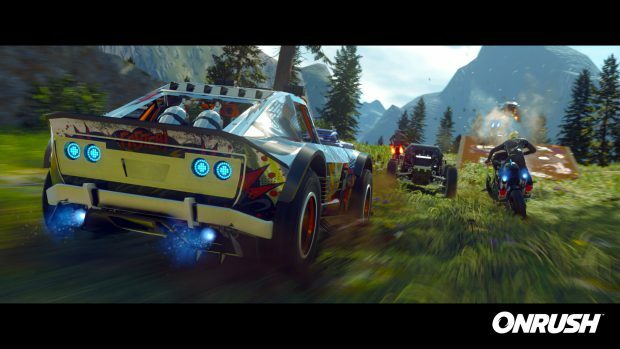 With 12 fodder in the action at any one time you will be seeing a lot of them in ONRUSH. But don’t worry – they pose very little threat to you. Think of them as moving, bite-sized packets of boost in a tasty metallic shell. Once you’ve had your first taste of fodder, you’ll be hunting them down for more. I hope you enjoyed our Director’s Cut of ‘The Stampede Is Coming’ trailer. As always, keep your eyes peeled for more ONRUSH news and content via the links below!